Super fast, super easy, super delicious. 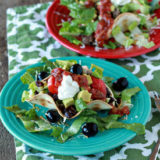 Taco salads make for a great dinner, and they’re perfect for mixed-diet households – make ’em just the way you want ’em. Vegan, vegetarian, full-on meat – whatever floats your boat. I am so, so out of my comfort zone right now. We’re a few days into life in the new house, but everything is still mayhem. Painting all the rooms before moving everything in has proven to be a painfully slow process – darn HGTV and their hidden staffs of 30 making these types of things look so easy and breezy! I always forget. Anyway, we are without Internet access at the new place, and so here I am at Starbucks, hands and quite possibly eyebrows dotted with Benjamin Moore Gray Owl, readying this brand new post to share with you. Today I have a quick and easy dinner – which just happens to be the story of my life right now. Quick meals are the name of the game for us, eaten usually standing up, and then it’s back to work. 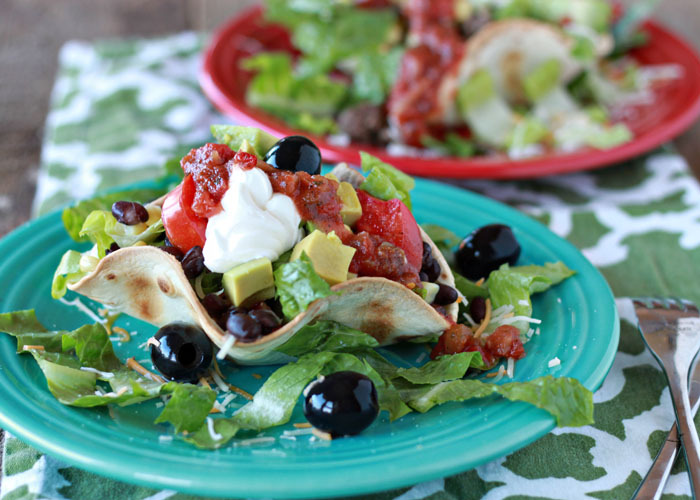 Taco salads are one of the easiest dinners around, but you know what? They kind of warrant taking a seat and savoring. I know they’re about as far from gourmet as you can get, but dang, they’re good. 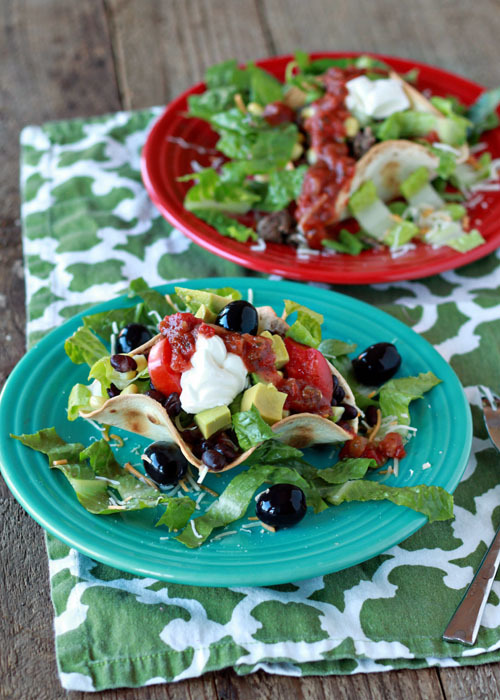 We like taco salads in our house because, well, they make for a quick and easy dinner, of course. But they’ve also got that super-awesome one-dish-two-ways thing going for them – because you dish them up individually, they’re easy to tailor for vegetarians, vegans, and meat-eaters alike. Then all you do is bake them for a few minutes, and, voila! Taco shell bowls. Then just fill those bad boys with whatever you like. I usually brown and season some ground beef for my guy, and warm up some plain black beans for myself. Those usually go on first, then some cheddar so that it can get nice and melty. 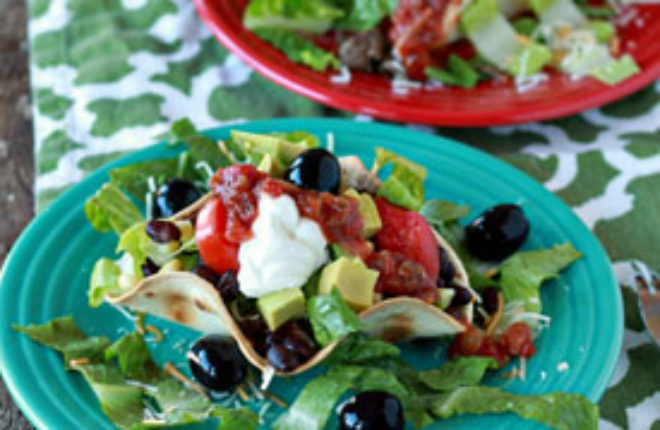 Add some shredded lettuce – romaine, green leaf, baby greens, whatever you desire – and top with whatever you want. Black olives, more cheese, diced avocado, cherry tomatoes, corn, scallions, diced red onion, salsa, sour cream … the taco salad is your oyster. Or the world is your taco salad. Or your taco salad is … oh, never mind. Just do what you want. It’s yours! And it’s yours in oh, about 15 minutes or so. Bonus. Just try not to eat it over the sink, standing up, with paint in your hair. Heat oven to 400 degrees Fahrenheit. 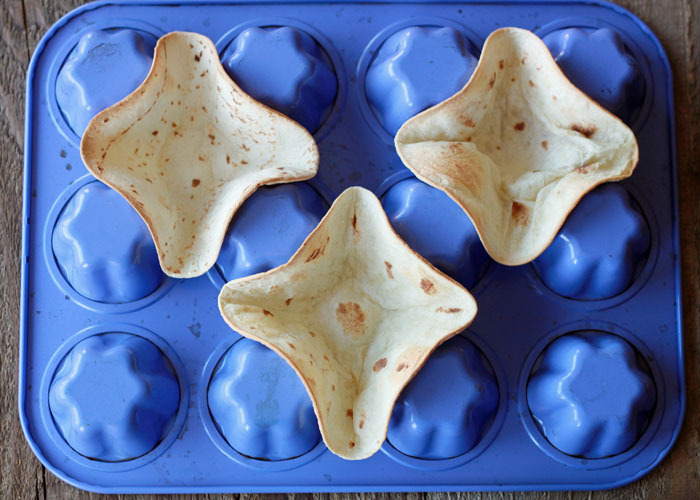 Flip over a standard-size muffin tin and tuck two or three shells in between the muffin cups to form a “bowl.” Bake for about 8 minutes, or until the shells are golden brown and fairly hard. Place shells on a plate and fill with whatever fillings and toppings you like. Taco salads are one of my favorite things to bring to work for lunch! Now I need to make those shells!